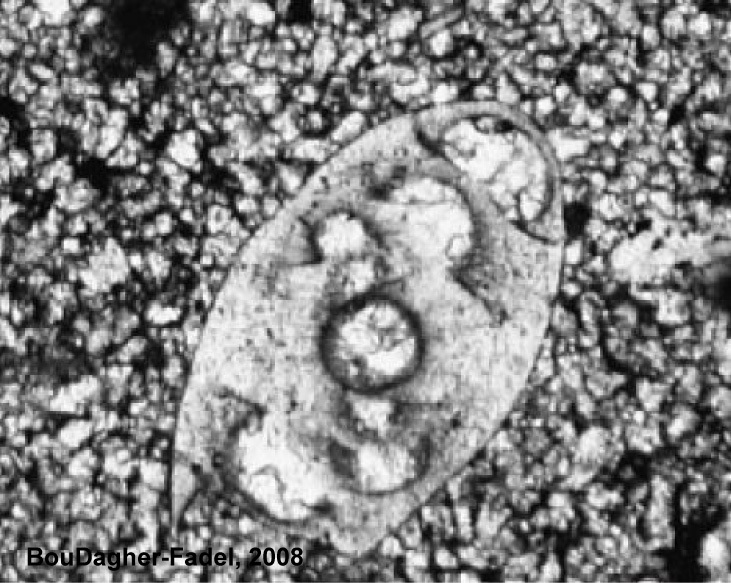 Thin section of Archaediscus, from BouDagher-Fadel (2008). The Archaediscidae are a group of fusulinid Foraminifera known from the Lower Carboniferous to the Permian. The test is streptospirally coiled in early stages in the genus Archaediscus, becoming nearly planispiral in later stages. Other genera are planispirally coiled for the greater part of (Brunsia) or throughout (Permodiscus) the test (Loeblich & Tappan 1964a). Characters (from Loeblich & Tappan 1964a): Proloculus followed by tubular second chamber, involute in early stage, later streptospirally or planispirally coiled; outer wall layer of radial calcite, inner layer finely granular; aperture at end of spiral chamber. [W76] Wang K. 1976. 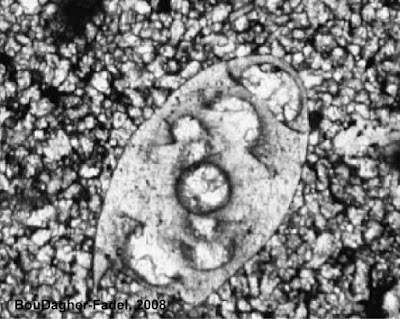 The foraminifera from the Changhsing Formation in western Guizhou. Acta Palaeontologica Sinica 15 (2): 187–195. [ZP86] Zhang, R., & J. Pojeta Jr. 1986. New bivalves from the Datang Stage, Lower Carboniferous, Guangdong Province, China. Journal of Paleontology 60 (3): 669–679.